When you and your colleagues want to collaborate on a document, use real-time co-authoring to see everyone’s changes as they happen. First you save the document to OneDrive or SharePoint Online, so others can work in it. Next, you invite people to edit it with you. 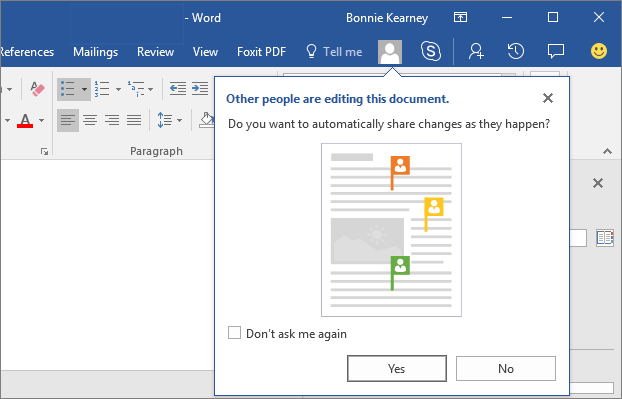 When they open and work in the document in Word 2016 or Word Online, you’ll see each other’s changes as soon as they’re made. While people are in the document you can chat with them instantly by using Skype for Business. Choose Share > Save to cloud. Choose the OneDrive or SharePoint Online location and folder you want, and then choose Save. If you’ve never saved a document online, choose Add a Place, and then add your OneDrive or SharePoint service by signing in. You only have to Save to OneDrive or SharePoint once for each document. The next time you open the document, it’ll save back to the same location aautomatically. To have Word send people a link to your document, type their email addresses in the Invite people box. Set their permissions to Can edit, and add a message if you want. 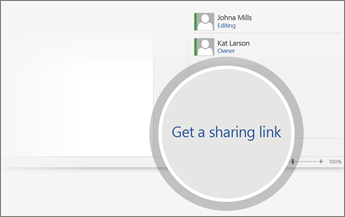 Make sure the Automatically share changes is set to either Ask me or Always, and then choose Share. Open and edit the document in Word 2016 or Word Online. 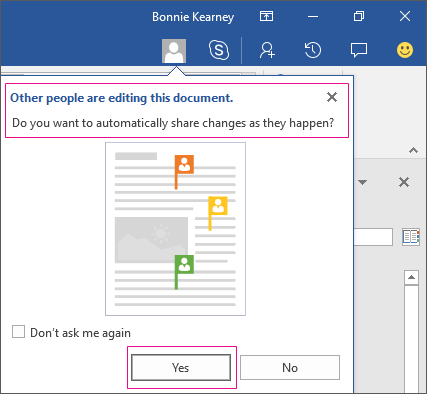 If you’re using Word 2016 and haven’t already agreed to let others see your changes, choose Yes to allow automatic sharing. When people follow the link you sent, your doc will open in their version of Word, or on Word Online. If they’re also using Word Online or Word 2016 and have agreed to automatically share changes, you’ll see their work as it happens. Word will alert you when people enter or leave. 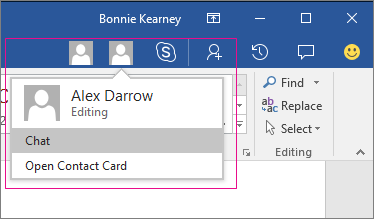 You can instantly chat with the people who are working in the document by using Skype for Business. It opens a chat window for instant conversation. 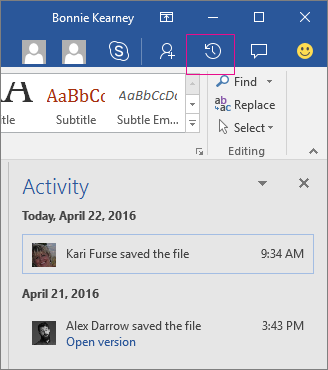 Choose the Skype for Business button to start a group chat with everyone working in the document. Choose Comments on the ribbon to make or view comments. Also, you can reply to or resolve comments and then mark them as complete. Note: If someone who didn’t opt in to real-time co-authoring is working in the document when you are, you’ll see that they’re in the document, but you won’t see their changes until they save the document. The Activity pane lets you see the complete list of changes made so far, and gives you access to the earlier versions. Choose Activity to see the Activity pane. Here’s what the options in the Automatically share changes list mean. Always: If you choose this option, others who have agreed to share their changes will always be able to see yours. Ask me: If you’ve never used real-time co-authoring before, you’ll be asked whether you want to automatically share your changes as they happen. Choose Yes to always allow automatic sharing when you’re working with others. Clear the Don’t ask me again check box if you do want to be asked the next time you open a document in which someone else is sharing their changes. Never: By selecting Never you opt out of real-time co-authoring for this and all other documents. Only you will be able to see your changes until you save your document back to its online location. Nor will you see theirs as they happen. You will, however, be able to see who else has a document open.